The Chicago Transit Authority published its Environmental Impact Statement for the proposed Red Line extension from 95th St. to 130th St. in the Riverdale community area last month, and it includes a couple of good and bad surprises. An EIS is a study that federal law requires before the United States Department of Transportation fund any highway or transit infrastructure. Scattered within it, the CTA describes how it intends to operate service on the extension, on which it’s proposed four new stops, at 130th, in Roseland, Pullman, West Pullman, and Riverdale. The EIS outlines the CTA’s intention to build thousands of expensive new car parking spaces next to each of the stations, an atrocious use of public funds. 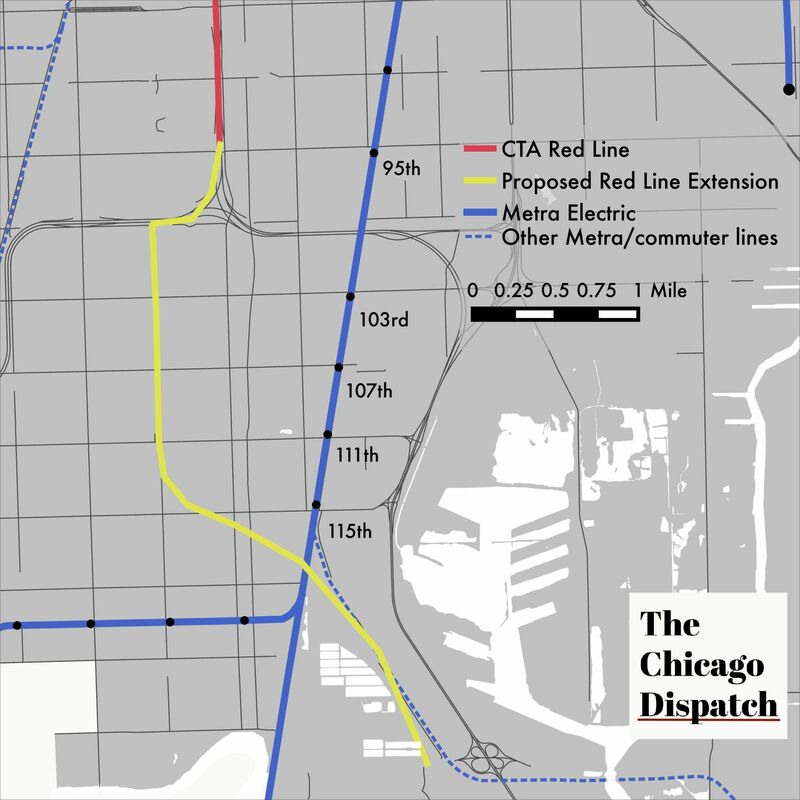 The CTA’s parking study for this project was conducted in 2009 and concluded that the Red Line extension could attract drivers affects by heavy expressway congestion getting to work or pay high costs to park downtown. The CTA intends to build 3,700 car parking spaces across all four stations, with 3,300 of them at two stations. Transit agency-built parking facilities have negative affects: they waste transit agency – public – money and aren’t a significant draw of riders. The CTA would spend tens of millions on a 7-story car parking garage with 2,300 spaces at the 130th St. terminal station. The EIS doesn’t project the cost of these garages, but if the median cost per space in Chicago is $22,425, according to a review of actual construction costs, this structure would cost over $51 million. At the Michigan Ave. and 116th St. station, the CTA would build a 3- or 5-story garage for 1,000 cars, at a cost of over $22 million. Some existing buildings would be acquired or condemned and then demolished in order to build the garages. Other parking studies show higher per-space costs. One of CTA’s parking structures could pay for all of those venues to open, and fund many public services in the area for years. The CTA is hosting a public hearing tonight at St. John Missionary Baptist Church, at 211 E. 115th St., from 5:30-7:30 p.m. Comments can also be made online at: RedExtension@transitchicago.com. Public comments are accepted through Nov. 30, 2016. You can also your comments to Chicago Transit Authority, Strategic Planning & Policy, 10th Floor, Attn: Red Line Extension Project, 567 W. Lake Street, Chicago, IL 60661-1465. I’ll discuss one of the positive surprises in a separate post. Nice catch. What are the odds they can be carved out? That depends on how many letters you send them. how obsolete! If only on this basis FTA should say no. I think, based on the EIR, that the parking utilization specifies that there’s a 90% usage rate at Kensington ME. If nothing else, perhaps they won’t need 3400 spots, just sufficient enough at 130 (and maybe 116) to handle the commuters coming in from the South, Southwest, and Indiana. It’s not a bad idea to have them use the garages; they would have to be properly paid for (or introduce some form of dynamic pricing to recoup the costs). Wow. I wonder if the garage at Cumberland provides any guidance about utilization. The utilization at Cumberland is 85%, but I don’t know when that count was taken. The other information from RTAMS says that it has 1,633 spaces as of the year 2000. The parking utilization rate table in the EIS shows the rates at other Metra Electric District stations, and compares them to their daily boardings. So it shows two things: many stations have a low rate, and many stations have such low ridership that I’m curious why Metra hasn’t already shut down those stations. At 103rd Street/Washington Heights it’s 30% of 267 spaces. 168 daily boardings. At 95th Street/Longwood it’s 51% of 104 spaces. 85 daily boardings. At Ashland Avenue it’s 52% of 90 spaces. 98 daily boardings. At Racine Avenue it’s 24% of 29 spaces. 33 daily boardings. At 103rd Street (Rosemoor) it’s 5% of 38 spaces. 43 daily boardings. So it’s half the size of the one at 130th and has the advantage of nearby airport and office parks. Interesting. Thanks! Look, I realize that publicly funded parking, whether surface or multilevel, is a bitter pill to the crowd here. In many respects, I’m totally with you – If the price of urban car storage and the price of fuel was actually priced at a market rate, this would be unnecessary. The consumer (driver) would make the calculation all consumers make: Is this a good value? Is it better to store my car in my own neighborhood for five buck today and take the train for five or spend 20 driving to a parking spot downtown for another 20? Easy! However, since urban parking is heavily subsidized and the price per mile driving is not even half the true cost, then the calculation is made to drive from basically anywhere in the outer metro. If we wish to get less car travel to and around the city, then in light of pricing it at a true market rate, for which there is ZERO political will, the only current option is to subsidize parking at these jumping on points. I will gladly pay a few bucks more in property tax to get thousands of cars off the cities streets every day. Not sure the airport and office parks would be a factor in parking there. I don’t imagine many people parking there and taking the train to Ohare when Ohare has its own, more secure, long term parking lots. For the office parks also have their own parking lots and I can’t think of a reason why someone who works at them would utilize the park and ride. But if there is less traffic in the city, won’t more people just decide to drive again? Isn’t that what induced demand is all about? Excellent point and true for those who are not making an economic but rather a travel time based decision. For others who are making an economic decision, subsidies are and will be needed to encourage use. God, if only we could just price things accurately and dispense with all these contrivances. At 95th & Longwood, the lot used to be nearly full every weekday. When they increased the price a little, more people started parking on nearby streets, as far as 1/3 mile away. I see lots of people with EP (Evergreen Park) resident stickers on their cars parking near my house and walking to either 95th or 99th. I think that increased congestion on the Evergreen Park section of 95th has also pushed more people to other stations, such as 99th, which has higher parking usage and more passengers boarding compared to a few years ago. I think it’s also worth asking how many commuters are currently dong a park-and-ride trip right now, but by driving into neighborhoods and parking close to existing L stations. I am willing to bet nobody has studied this in detail, as this is a long-standing problem on the North Side and one of the reasons Chicagoans push for permit parking – it’s not always to “reserve a space in front of their house” as some have described it, or a defense against visitors, it’s to keep suburbanites from using city streets as default park and ride space. There are also plenty of Chicagoans who drive from their home close to the L due to poor or non-existent bus service. I see people parking in my neighborhood on the streets that aren’t permit zoned to walk to the L all the time, what the remedy is, I don’t know. The key would seem to be for CTA and the City to work in tandem on these issues. If you give a carrot by increasing low-cost parking at stations (or create new stations with parking), you need to have a corresponding stick by way of a reduction in City-owned parking spaces in the loop. Several private lots have closed as land value has justified building in the loop again, but that alone may not be enough to ensure other drivers don’t pick up the slack following increased transit use. If there is sufficient capacity to handle the extra street parking, I’d say there is no problem to fix. I’d guess there isn’t sufficient capacity in many city neighborhoods (including yours), however. I dealt with this on my street in Oak Park (which is very near the blue line), and to be honest it never bugged me because we have enough street parking capacity that it was hardly a blip, and I’d prefer the cars stay off the roads. However, it bugged my neighbors enough to get a parking ban instituted on our street from 10 to 2 Monday through Friday. Of course, all it did was push the cars one block north, until the cycle repeats. 3. Providing the transit trip where only about 50-something % is paid by the rider. Supplying a place to park is not a way to get thousands of cars off the city’s streets every a day. Supplying better last-mile, non-car connections like walking, biking, and transit, is. The CTA is not a city planning agency, and thus they have little say-so in how people get to their stations. That they even considered this is mind boggling. The remedy is more expensive on-street parking (already subsidized by those who park elsewhere, or never park in the city), and/or better “last mile” transportation (bike, walk, transit). Most trips are non-work trips, and most trips are 2-3 miles. That we still support driving for these trips is unfortunate, to say the least. Who is allowed to park on your streets? Is that limited to just OP residents? For Chicago it’s a free for all if the street isn’t permitted. about additional vehicles clogging up the streets that do not belong there. Literally – they aren’t buying City stickers or paying Chicago-premiums for their car insurance, they’re being subsidized for sure. These people are by and large in a huge rush and rolling (if that) through stop signs and in general a colossal PIA as they screw up the flow of traffic and troll for parking. To Steven’s point, I’m specifically talking about the rush hour commuters. It sounds like this is a case of too much parking, but I think you do want to encourage people to get to these new L stops, if other public transit options are limited parking might be what it takes. I get all of that. It is just that many people under way in Chicago are coming to, coming from or intersecting the loop. This makes the automobile the most degrading choice of transit for throughput and quality of life issues for residents in each and every community intersected. Yes, it’s totally illogical but it does get individual cars off the streets of Chicago by reducing the distance traveled be each individual. It is a subsidy which is necessary because it is competing in another fully subsidized market. I think we could agree on that we shouldn’t even need to be having this conversation as all these subsidies should be eliminated but…..
Anther issue is that transportation planning for the last mile in outlying communities as you addressed in your comment involves the cooperation of municipalities which are often wholly controlled by people who only travel by private automobile. What is your alternative other in lieu of actual solutions like raising the gas tax and eliminating free parking everywhere which are never going to happen? As a planner who specializes in parking policy (and who is speaking as a citizen, not on behalf of my employer), I have been arguing for years that no public agency should spend money on parking for several reasons. First, the financial benefits to the city of having tax-generating, productive uses next to the train far outweigh the benefits of storing cars all day long. I believe that even the benefits of a public park, that does not generate revenue would outweigh the benefits of having parking next to the train. Second, the future of mobility is unknown. Demand for parking may drastically decline and garages are typically built with public funds to be paid out over 30-40 years. We don’t know if we’ll need parking next to the train in 5 years, let alone 40 years. It will be a waste of money and tax payers will be on the hook for it. There are also on-going maintenance costs. Third, if there is a demand for parking, the private sector can fill it. Let the market determine it. Let’s preserve some open space near the station upon which a private developer could build a garage on in the future, if necessary. And finally, no driver will pay what it actually costs to provide parking. So we will be subsidizing drivers at the expense of people arriving by bus, walking, and riding bicycles because of the added traffic and congestion. CTA’s own buses will suffer because of it. Very good point. I cannot fathom why so many people drive into the heart of the Loop, it just seems like such an exercise in futility. During the day, outside of the restriction they just imposed, anyone can park. Given that this is SE OP, you get people from Chicago, Berwyn and Cicero. OP has a surplus of street parking given: (1) abundance of garages; (2) a lot of families having only 1 car; and (3) very restrictive night time parking. That said, it also has neighbors that view even 1/3 of the street being occupied by people who don’t live on the block as a nuisance. Again, I personally have no problem with people utilizing the extra capacity as longs as there is extra capacity. OP has people that might otherwise be able to afford downtown parking rates, and are close enough that even in rush hour they can get to the loop fast enough that they might drive, if they didn’t have the option to park close and ride. Plus, utilizing the extra street parking keeps OP from building more and more parking near the metra in OP, which people are increasingly pushing for out here anyway, and is generally subsidized in a way that costs taxpayers money. Gotcha, yes, I remember the restrictive night time parking. I think what you’re saying makes sense, I grew up near the border of Lake View and Lincoln Park (383 and 143) and they both have permit zones which are in effect from 6 pm – 6 am. My current neighborhood (Belmont Blue) has permit zones 24/7, which seems like overkill. But on the other hand, the traffic is kind of insane as-is, I don’t know how much worse it would get if they started inviting more traffic seeking parking in rush hour – the big difference I see is that we are super close to not only the Blue Line but also 90/94, whereas zones 383 and 143 don’t have this issue. I definitely don’t understand the flow for these proposed stations and am not familiar with the areas, I guess I’m just saying in general park and ride is good thing – John G wrote a nice piece about pedestrianized streets, but that’s because those cars all drive through my neighborhood/the one directly north to park in the lots by DeVry and now at Irving Park. Still preferable of course, but it’s not like people aren’t driving to Wrigley, they just are only driving part of the way. This seems kind of similar, except that the cost is absurd for sure. The problem in OP is that even though we have two L lines and a metra line, they’re grouped closely together in the middle and southern parts of town. People that live in North OP can be up to 2 to 3 miles away from a train, with pretty spotty bus connections servicing the routes. So, I do have sympathy for people who live in what is considered a transit-rich suburb, but in reality have a very difficult time using any of it. Many parts of Chicago are the same, unfortunately, and it’s something that needs to be considered regarding park and ride options (and I personally agree it can often be a good thing, even if it needs to be subsidized). I personally am not a very big fan of this extension as it is, mostly because I don’t think the city leverages its existing S and SW CTA lines well enough. Its a tough trade-off, as I think everyone deserves access to reliable transit, but unfortunately, money isn’t infinite. Help define “them” for me, and I’ll get writing. I would imagine that the City planners are operating under the “build it and they will come” model, as with TOD new L stations can justify large zoning bonuses which in turn create developer incentives due to economies of scale, etc. But it’s already built and they haven’t come (equally) yet. The TOD creep into the South Loop is encouraging though. However, this extension isn’t into “hot” areas that are just waiting to be unlocked with public transit investment. Why would a developer build in Roseland over say, North Lawndale? It may take years and years, but what it does is send a sign that the City has made a substantial investment and is likely going to protect it/bolster it as population grows. The South Loop is the perfect example, 20 years ago you didn’t want to be walking around even in broad daylight, now look at it. Zoning can be both a quick strike and also setting up a much deeper strategy in the larger chess game that is development. L station proximity is real estate gold, even if it isn’t always obvious and needs a bit of polishing. The question is how do you reduce congestion downtown and along the Dan Ryan, Bishop Ford & I57? The 130th site is a near perfect location if you are building a RLEXT as it is very close to the Bishop Ford. The BF was hampered in the Dan Ryan’s last rebuild with only two in/outbound lanes. More of those cars need to get off the road into transit. Raise the price of downtown parking and transit looks and gets better. But it has to be fast like express trains. Back in the seventies we had A/B trains that got downtown quick from 95th. Why did they stop that? One point to add about 24/7 zones. I live in one in Albany Park. The lack of cars bc of the zone means the cars that do use it as a cut-thru go too fast. More on street parking would likely slow vehicles down and improve safety. The developments in many of the downtowns along UP Northwest Metra line offer some ideas. Some of the Metra parking is private, there have been a lot of dense developments that has led to a transformation of that area. Parking counterpoint: the Route 59 parking lot that is as large as Singapore I think. You are talking about 3,300 cars. The number of people who will be in those cars accessing the CTA can be picked up in less than 4 ‘L’ trains. These cars are not even removed from city streets – they are still coming from somewhere, and being driven on streets somewhere. They would be redirected, at best, through attraction to new parking garages that would provide parking that is probably cheaper and easier to access than elsewhere (especially compared to downtown). We don’t even know where they come from. What Aurora and Naperville are doing at the Route 59 parking lot is a major disappointment and a poor use of public funds. They are expanded the parking lot by over 400 spaces this year. That means 400 more people have easy access to drive to Metra (not considered the “ease” of driving in that area). Imagine if that space (and probably a bit more because allowable density in this part of the state is still quite low) was devoted to building housing and retail. You could fit a whole lot more than 400 people, and you could make it so they could walk to Metra and more of life’s necessities. The two cities would then be earning money instead of spending it. All true and I don’t want to beat this into the ground but I would point out that the assumption is that the cars sitting in these parking outposts each day would otherwise be sitting closer to the city after having been driven greater distances. For the communities who suffer under this transfer and storage, this is a benefit. OK, I can see putting ONE garage at the end of the line. But there’s no excuse for garages at the intermediate stations. Hi Lindsay. I agree overall with the sentiment of the folly of public funds for free parking. The reasoning you listed even adds more heft than what I was coming up with. We are already using public money to fund the private automobile. This is not going to change in the foreseeable future. If these cars now driving 3 miles to free parking instead of 33 miles to their destination, then the subsidy for driving on the roads is replaced by the subsidy for storage. If those 60 daily miles cost the general public 50 cents per mile in subsidy (an argument could be made that it is higher or lower), then there exists a 30 dollar delta per day of public funding. For someone using these spots every working day, we are around $6,000 of ‘saved’ subsidy per year which would (could?) be more than the annualized cost of these spaces. Again there are so many moving parts to this including how to put a value on things like the true societal costs for each moving vehicle, the value of open space, the cost of getting hit by a car, etc etc. but it is possible that on the issue of ‘subsidy’, it may be less expensive to subsidize this parking than to not. JFC, I am arguing for a parking ramp. I should have my head examined….. I recall a lot of German (at least in Bavaria) cities being constructed in the same way. Cars essentially banned from the inner city, but a decent amount of parking garages and surface lots ringing that area where people parked and then used transit or walked the last 1 to 2 miles to work or home. My parents lived in Taipei, Taiwan, and that was also a fairly common model. Building parking lots for mass transit use outside of a city’s core isn’t just a U.S. sprawl-driven concept. According to the latest CTA ridership report I found online, the average weekday daily entries for the Red Line-Dan Ryan for July, 2016 were 48,073. If you assume the drivers of those 3,300 cars enter the Red Line-Dan Ryan twice, that represents just under 14% of the current ridership. If the argument is that 3,300 cars is too small to worry about, the entire South Side of the Red Line isn’t really that much better. So we might as well just let everybody drive to the Loop. Route 59 is Metra’s best example of a “cornfield” station, built solely to provide parking for the residents of single-family subdivisions miles to the south—without requiring more parking in downtown Aurora or Naperville. Any new multifamily housing belongs in central Aurora and Naperville, where it can be part of a functioning city, not at Route 59. The Azusa Gold Line extension in L.A. didn’t build adequate parking at its outer stations for the numbers of people trying to drive to the stations to access Pasadena and downtown L.A. and it caused a big local controversy when the extension opened. You can’t expect–or think you can force–everyone to access rail extensions via bus transfers. What caught L.A. Metro up short was that people decieded to drive to the new Gold Line stations from much farther away than anticipated. And all of those people assumed that the news stations would offer adequate parking since they were so far out. The question on the far south side of Chicago near the proposed Red Line extension ROW is not just how many people will want to drive to access the new stations, but how far they’ll be driving from. The farther they come from, the less chance of them arriving on a bus. I’m sure they’re also expecting to poach riders from the suburban portions of the Metra Electric and Rock Island lines, and for people to assume they can drive to the stations from the Bishop Ford. You really have to be clear why you’re building and extension and who you expect to use it. There’s no universal answer to wether parking should or shouldn’t be built. It has to be a contextual decision. Also with that in mind, I’m not really sure what other uses people are expecting to be built at 130th Street. We are not talking about burgeoining commercial districts with dense communities within walking distance. We’re talking about the ragged outer edge of the south side. The Red Line extension is not a magic wand. As urbanists, we can’t spend our whole lives being pissed off at parking and drivers. There is always a middle ground. And frankly, it’s just not tenable. All that will happen if meager parking is constructed along the extension is that the people who can’t find a parking space will simply keep driving downtown. Would we rather have them driving to 130th Street or driving to the Loop? I hear what you’re saying, but to some degree, it feels like “since we’ve been doing it wrong for so long, we should just keep going the wrong way, because it would be too hard to change things up now.” But as soon as roadway space opens up, more drivers will fill it, so it’s not like we’d be “saving” anything. There’s already a few hundred units north of the RR tracks in Aurora, with direct sidewalk access. It’s taking me a long time to review the EIS (it’s nearly 300 pages long), but I haven’t yet found an equivalent (or greater) investment in increasing bus transit that’s linked to the 4 new stations that has a higher capacity than the parking garages. I did find that CTA expects to save some people some time, and some money itself (and Pace, too), by shortening bus routes so that they go to 130th instead of 95th.